At bambu, we are big fans of creative installations and works of art particular those that use found or renewable or reclaimed materials.....or common, everyday materials used in imaginative ways. We have shared a few stories on the pages of this blog of how artists have used bamboo in creative ways, and in interesting settings. 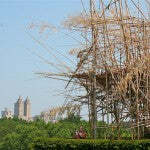 The Big Bambu installation atop of The Met in NY. Story is here. is magnificent example that we personally visited. 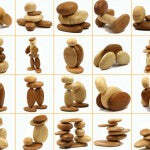 We also spotted an artist in Germany acquiring and using our own Bamboo Pebbles to create this Pebbles sculpture here. Interesting. Or this story closer to home here in Shanghai using bamboo chopsticks. here. Well, below is an extraordinary feat of imagination and precision and entertainment....stands alone. Scott Weaver's amazing piece, made with over 100,000 toothpicks over the course of 35 years...this deserves a watch! Another extraordinary installation and creative interpretation using bamboo.